Pioneers in the industry, we offer 3piece flanged ends ball valve, flanged ball valve, forged steel ball valves, stainless steel ball valve, 3 way screwed ends ball valves and 3 piece screwed ends ball valves from India. The qualitative range of 3Piece Flanged Ends Ball Valve offered by Industrial Flanged Ends Ball Valve us is widely appreciated for its dimensional accuracy. 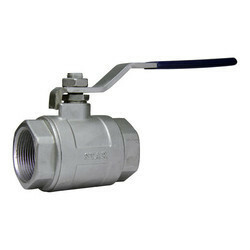 We manufacture this range using stainless steel ball valves and stainless steel pin with Teflon sheets. All these material provide our range with optimum durability. 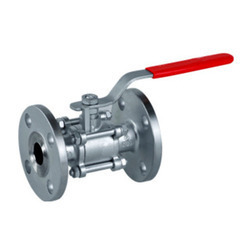 We are a preeminent manufacturer and supplier of a comprehensive collection of Flanged Ball Valves.Widely used for common fluid control applications, these ball valves are available in different models. These are available in standard as well as in customized finishes and are ideal for economical automation. The two piece ball valves we offer to clients are known for maximum structural strength, accurate dimension and easy usage features. The qualitative range of Forged Steel Ball Valves, which is offered to customers at industry competitive Our professionals ensure to design these products so as to meet the demands of different areas such as chemical and petroleum projects. 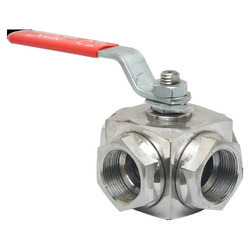 Port Size 1/4" ~ 2"
We offer a wide range of 3 Way Screwed Ends Ball Valves that includes full port and standard port valves. These are available in 4" BSP & Socket weld, tri-clamp and even large flange connections. The full port can be easily automated and is offered i a variety of seat materials. Our range of 3-way ball valves is available with either T-Portor L-port as per the requirement. Apart from this, it also has a bolt onside flanges that enables easy seat changes. We are counted among the most respected providers of superior 3 Piece Screwed Ends Ball Valves. These highly demanded valves feature a robust construction that ensures a long service life. Furthermore, these valves are highly appreciated for their dimensional accuracy and non-abrasive nature.